AllokSci, AlloKating Science — WTF is LIGO & Why am I Hearing so Much About It? What is LIGO and why have I been hearing so much about it? So what exactly is LIGO and how does it work? Surprisingly its pretty simple setup. There are now 3 facilities that can detect these waves all in remote locations as to be careful to not pick up environmental noise that can hamper readings. There are two widely separated installations within the USA, one in Hanford Washington, the other in Livingston, Louisiana. Both facilities are operated in unison as a single observatory in order to negate false readings and in helping to triangulate where the wave came from. LIGO works with VIRGO, a third facility to detect gravitational waves located in Pisa Italy. These 3 organizations made an agreement in 2007 to share information and work together. This formation allows the researchers to confirm signals and pinpoint the origin more easily because this technology is not directional this is really important. 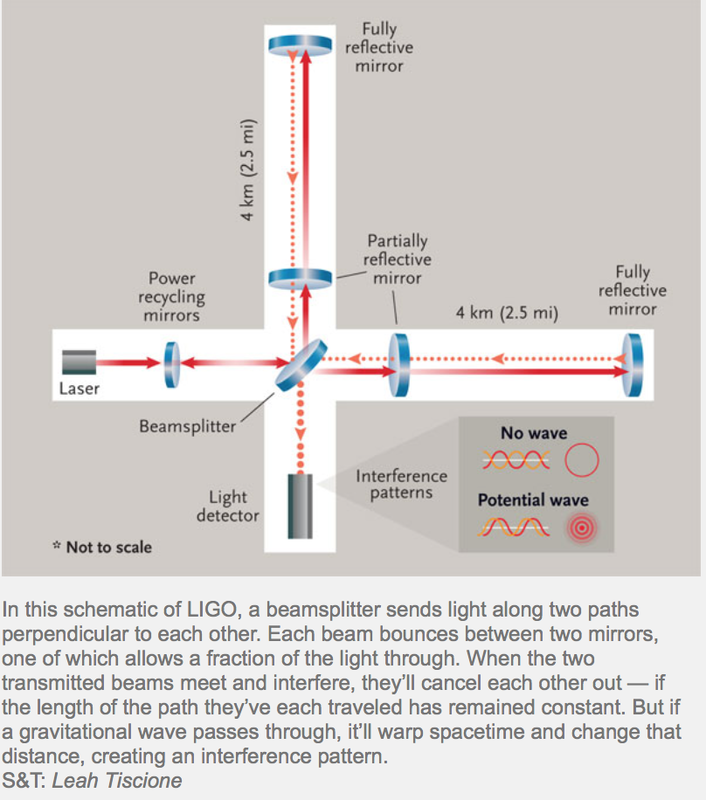 LIGO for instance is in the shape of an L with each portion being 4 km long or 2.5 miles long. The longer the the arms of the interferometer the longer the distance the laser travels allowing more sensitivity. “LIGO’s optical components quietly reside in a colossal vacuum chamber encompassing 10,000 cubic meters (353,000 cubic feet), with an air pressure of 10-9 torr, or one-trillionth of an atmosphere.” This laser is shot to the end of each arm and reflected back by a mirror at the end. In order to make this design more sensitive, scientists added a beam splitter that reflects the laser continually around 280 times before they are merged back together at the photodiode. The beams are forced to interfere and the intensity and pattern of light is read. The way you would detect a ripple in the curvature of spacetime is by observing the different arrival time of the light wave's "crests and troughs" from one arm and compare it to the light from the other arm (as they were reflected off the mirror at the same time). A ripple does not change the speed of light that these two beams travel at but it does ripple space making the distance of one arm of LIGO differ from the other. This is turn will change the laser wave pattern and we can measure that difference. When the beams recombine and depending on the distance the peaks traveled they will be in sync or out of sync. If they merge and are in sync i.e. the peaks or troughs match, they will recombine creating a brighter beam. If the beams are not in sync, they will begin to cancel one another out a phenomenon called interference. The ability to use interference, allows us to use the difference in wavelengths as a meter stick to measure displacement. This technology has been utilized in several areas of interest since its infancy. One being the engineering of a vibrating plate that stimulate stem cells to turn into boney tissue. This will be used in the exploration of development of boney tissue in the lab for transplants, as well as test new drugs. August 17th, 2017: LIGO and VIRGO collaborations announced the 1st ever detection of gravitational waves. They originated from the coalesced binary neutron star system. The inclusion of the Virgo detector in the observation effort provided improvement of the localization of the source by a factor of 10. A gamma-ray burst was detected by the space telescope Fermi (GRB 170817A), occurring 1.7 seconds after the gravitational wave transient. The signal, originating near the galaxy NGC 4993, was associated with the neutron star merger. October 16th, 2017: LIGO and VIRGO detect first gravitational waves from a colliding neutron star!